Crafty Bootcamps from Handmade Sessions! A Participant in the wood carving Session. The Handmade Sessions/ Seisiúin Lámhdhéanta are open and teaching, but it's a bit of a learning curve, to say the least! Lots of promotional material distributed all over the county, but it just takes time for people to know that you are there. Quite a lot more local people coming in for Sessions than visitors, which is surprising, but great news for the state of craft in the county! Monday we are getting started in our Crafty Bootcamp, a summer camp for 10-15 year olds in our venue in Dingle, Co Kerry. Live from John St, we will be teaching felt, stitch, dyeing, crochet, patchwork, and drawing. It will be a very busy week! We have room for 12 students for the Monday through Friday camp. The fee will be €60 with materials included and I can give a small discount for multiple bookings. We will run every week until the end of August, so that's what I will be up to for the duration of the summer! I am excited, though! Children from 10-15 years are generally very enthusiastic and well able to follow directions and get stuck into a project. It's wonderful to spread enthusiasm for craft and show them how satisfying it is to create objects by hand, to say nothing of the fact that it will give them appreciation for the time and effort that goes into it! Meanwhile, I am just grateful that the time of cleaning, dead spiders, and painting is over. I don't mind spiders, but the sheer number of them was a bit unnerving. The other milestone is that Original Kerry is launched! The website is lovely and live, due in large part to the great efforts of Deirdre Johnston, the craft coordinator for the county. 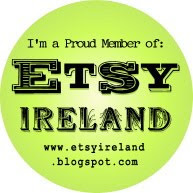 Check it out at http://www.originalkerry.com/. Craft in Kerry is under original producers and "mixed craft," which is a little confusing, but we are there! There are Original Kerry gifts and the three new craft trails that have been established to show off the fantastic artisanal talent that our county boasts. Most of the stops on the trail are interactive and allow for people to view craft being made. Hop in the car and take a look at craft being developed--it's a great day out. For more information on the Crafty Bootcamp, email handmadesessions@hotmail.com or ring 087-9111793. Craft is for every day!